A member of Italy's new government has described the country's large public deficit as a "disaster". Deputy Economics Minister Vincenzo Visco warned that the deficit could exceed 4.5% of gross domestic product (GDP) this year, above eurozone rules. Under guidelines for the 12 nations with the euro, members must keep their public debts below 3% of their GDP. "The economic situation is very serious and the state of public accounts is a disaster," said Mr Visco. His warning came ahead of a planned meeting on Wednesday between Italy's Economics Minister Tommaso Padoa-Schioppa and European Union Monetary Affairs Commissioner Joaquin Almunia. 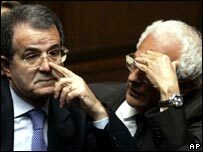 Brussels has given Italy until the end of 2007 to reduce its deficit below the 3% guideline. Mr Visco said he did not believe Mr Padoa-Schioppa would ask for more time. His comments came as Paris-based economic think tank the Organisation for Economic Cooperation and Development (OECD) said it predicted Italy's deficit would hit 4.2% this year, rising to 4.6% in 2007. The OECD further estimates that Italy's economy will grow by 1.4% in 2006 - faster than the 1.1% previously expected - but then by only 1.3% in 2007. It said this year's Italian growth was being fuelled by stronger export growth and a recovery in business investment. But it warned that Italy would continue to trail behind average eurozone economic growth "without bold structural reforms by the new government".